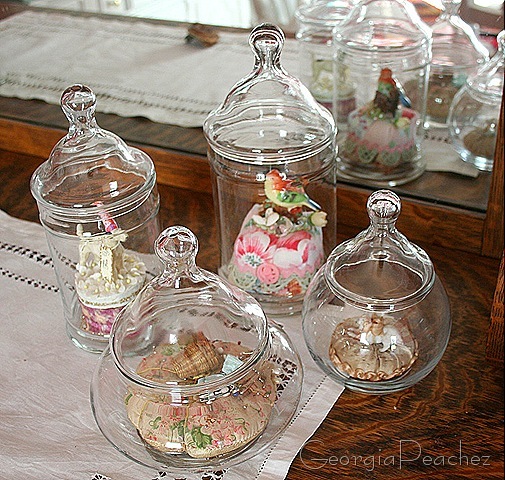 I've had these left over apothecary jars from Christmas sitting out because I wanted to think of something to do with them. 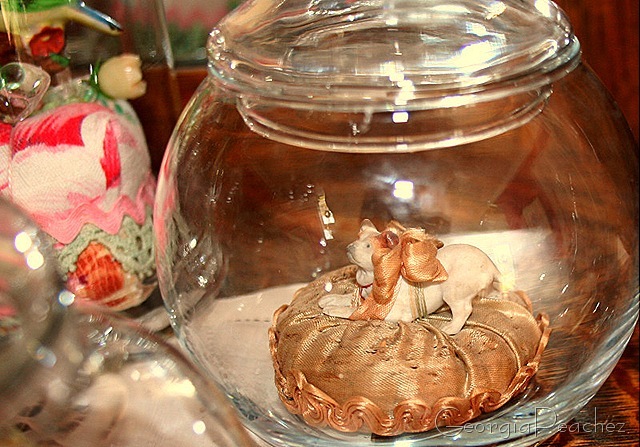 These are easy to find at the thrift store and you can make all kinds of little "terrarium" arrangements with them. I especially love the shape of the round ones. I'm going to "shop" around for something to display in these. I think I'll stick some pin cushions in them. Two of these are vintage and the prettiest one in the back was made by Beth. The little terrier box was a gift, he's not a pin cushion, but cute! I've got some special pin cushion news coming soon here and over at Beth's blog. I like this idea! Adds an elegant touch to these pretty pin cushions. And what a great way to keep the dust off of these sweet little things that are so cute to have out all the time, but so hard to dust! Thanks for sharing! Love the beautiful wood grain of your buffet! Great minds think alike Suzy. I just got my first pincushion from Beth (have been haunting Etsy waiting for the right one) and I stuck mine on a little pedestal and then put a dome over it. It looks absolutely adorable…I’ll be posting about it soon. Beth is one talented gal. also saw your post on Romantic Homes – way to go for Beth! I need to go pick up a copy at the newstands. 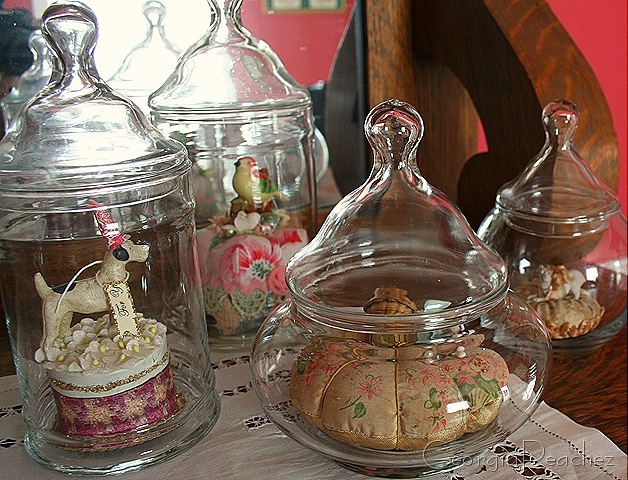 I love the pin cushions under glass. Cool idea! Okay, I’m in official mourning because they are no longer going to publish Mary Engelbreit’s Home Companion magazine anymore. What a cool idea!! I collect pincushions…hmmm! 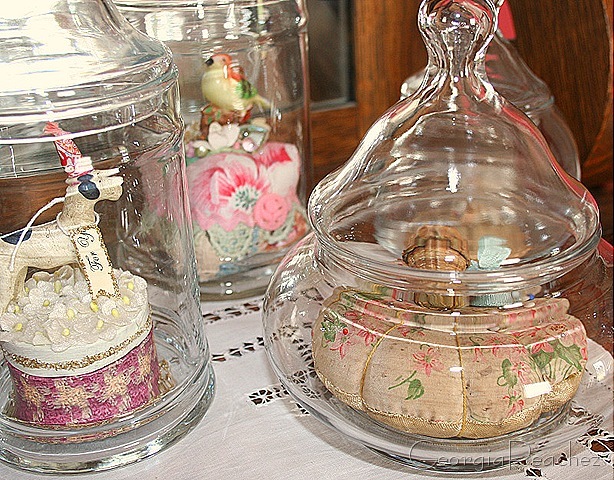 What a great idea — they look wonderful under the glass! 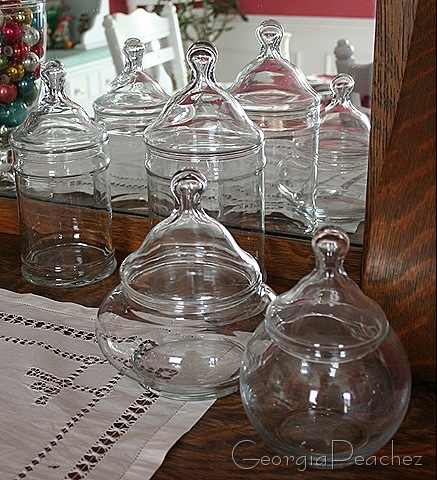 I have several of those jars I have picked up here and there but havent figured out what to do with them yet. Don’t have any pretty pincushions though.